Optimization of processes with web and app technology. It is an App that allows you to naturally and safely use an already spread habit in the professional environment: the use of instant messaging to report incidences or different types of cases within the company. 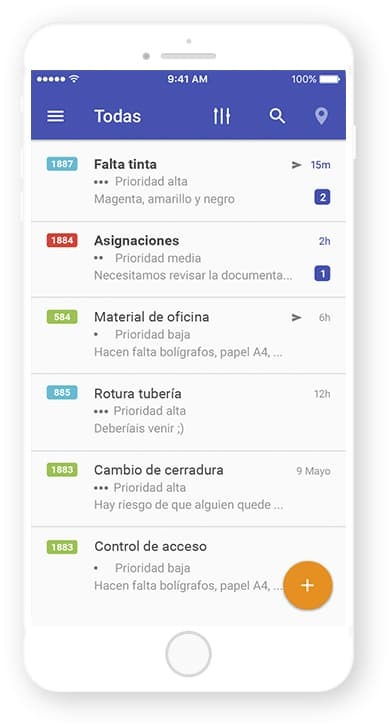 This contribution is made by Sefici, a Cuatroochenta project designed for the easy and efficient facility and equipment maintenance management, both from mobile devices and from web administrators, with which you can create projects and process all the reports. Following the “software as a service” (SAAS) model, Sefici is a free to download App and can be used for free by the first four users of the project. It has really affordable rates which are inversely proportional to the volume of employees. The development of the initial tool of which Sefici is a spin-off started in 2014 with the aim of responding to a real need of several Cuatroochenta clients: managing incidences in a way that is fast and easy to use anywhere by any employee, highly customizable and low-cost. Sending of media files and incidence geopositioning. A calendar that can be synchronized with your personal one.